Most of the KPIs we’ll be discussing in this article are low-level KPIs because they’re marketing-specific. KPIs are easily confused with business metrics, and if you dare Google the difference, you’ll be met with a lot of professional jargon. If you look in the dictionary, the definition for “metrics” sounds suspiciously close to how businesses define “KPI,” too. In relation to KPIs, though, and for our purposes, metrics are the results of the KPI, the actual numbers you’ll see as your efforts are tracked. 1. Define your inbound and outbound marketing tactics. Many of the KPIs you track will focus on one or the other, or how they relate to each other. Inbound marketing attracts your target audience to you. Blog content and website content are examples of inbound marketing. Outbound marketing includes advertising and email marketing. Today, the lines between inbound and outbound content marketing are blurred (a blog post can be sponsored as an ad, for example), but differentiating them will help you choose the right KPIs. 2. A KPI is only as useful as it is actionable. If you can’t use the information you gather in an actionable way, the KPI isn’t worth much. I can’t stress enough how important “actionable” is to KPIs. If you’re having a hard time determining which KPIs will be actionable, work backward: list the components of your marketing strategy that you can manipulate; trim the list down to focus on the areas that need improvement; then determine related KPIs. This is by no means an exhaustive list. Instead, I’ve highlighted common marketing KPIs that you may want to consider tracking. Cost Per Lead refers to the cost to acquire a customer. You should track inbound and outbound costs separately. You can also break down costs by campaign type to determine how profitable your campaigns are. For example, your social media marketing may be costing too much and delivering too little, while your email marketing may have great results and will benefit from a higher budget. MQL: A lead that is more likely to become a customer when compared to other leads. They may have signed up for your mailing list or downloaded the freebie from your landing page. SQL: A lead that has been vetted more than a MQL. The sales department feels that these leads are ready to be contacted directly because they’re very close to making a purchasing decision. Distinguishing between MQL and SQL helps determine your Leads-to-Close ratio, which is the number of leads you’ve received divided by the number of leads you’ve closed (within a specific time period). If there’s a surprising variation here, it could mean that the marketing department isn’t generating quality leads or the sales team isn’t handling your MQLs correctly. The website traffic to website lead ratio tells you how many of your visitors convert to leads. By tracking this, you can determine if you’re attracting the right audience to your website and how optimized your website is for conversions. Customer Lifetime Value is measured like this: (average sale per customer) x (average number of times customers buys per year) x (average retention times for a typical customer). If your Customer Lifetime Value metric is low, you’ll want to develop better lead nurturing campaigns to more effectively push customers through the buying process. If the goal of your marketing is to drive sales, then you have to figure out which campaigns are driving sales and which are a waste of time. Ultimately, you want to determine how your marketing is impacting sales, and then you want to remove the marketing that is intended to drive sales but that isn’t seeing results. 1. Inbound Link Building: When a reputable site links to your content, your search rankings can improve. Instead of no-follow links, you want those sources to use “followed linking root domains,” which means that Google follows these links. 2. Keyword Click-Through Rate: This tracks how often your listings appear in search engine results vs. how often they’re clicked. This tells you how effective your listings are at getting clicks. 3. Keyword Ranking: This KPI measures your search engine rankings for keywords in the top results. The higher you’re ranked by Google for keywords, the higher your organic traffic will be. Don’t wait too long to analyze a SEO KPI. Checking them every month lets you optimize your SEO strategy on a consistent basis. Your social media platforms probably have built-in analytics that let you track both paid and organic performance. Here are three KPIs to consider tracking for a broader view of your social media performance. For email marketing KPIs, check out this article with 10 email marketing metrics to consider tracking. 1. Social Sentiment: This KPI measures brand mentions across various channels, including blog posts, press releases and social media. You’ll need a social listening and analytics tool to track this, such as Hootsuite. 2. Social Interactions: This KPI measures how well your social media campaigns create positive engagement and interactions. For example, a post that went viral that you didn’t have to nurture is an example of a positive interaction. 3. Social Traffic and Conversions: With this KPI, you can determine how effective your social media campaigns are at generating website traffic and conversions. Check out our article with 40 of the best social media analytics tools for WordPress users. There are all sorts of ways to track website traffic. Whichever measurements you decide to take, know this: your website traffic will tell you a lot about your customers, including what they want from you and what they’re not getting. You don’t have to track all of this website data at the same time. Instead, focus on a specific website traffic problem you’re having and choose a KPI (or two) to match. Let’s say your bounce rate is higher than expected. You want to improve bounce rate and average session duration to keep visitors on your web pages longer. You take action by updating your landing pages so the content visitors are landing on is closer to what they’ve searched for or what an ad promises. After a month, you run a report to see if bounce rate and average session duration have improved. If they have, you know you discovered the problem. If they haven’t, you’ll need to dig deeper. Your marketing objectives should be attainable while also requiring some “stretch” to reach. Refer to your current performance when choosing your objectives. Which areas need the most improvement? What is the desired outcome? Why does that outcome matter? Choose KPIs that match up with your objectives. The KPI is clearly defined and easy to understand. The data is easily attainable. You know how to measure the progress and how to determine when you’ve achieved the outcome you want. You’ll be able to get accurate and timely feedback. You can monitor the KPI and collect data consistently. Measurement can be integrated into your business processes. It’s best if the data can be auto-collected. You can turn the insight into actionable marketing efforts. You can control or influence the KPI by taking action. If the KPI doesn’t tick all of these boxes, reconsider adding it to your strategy. A KPI that is costly or difficult to track or understand, or that doesn’t produce actionable insight, isn’t worth your time. Decide how you’ll track the KPIs. Once you’ve chosen which KPIs to track, you’ll gather and analyze data using a real-time reporting tool with a comprehensive dashboard. 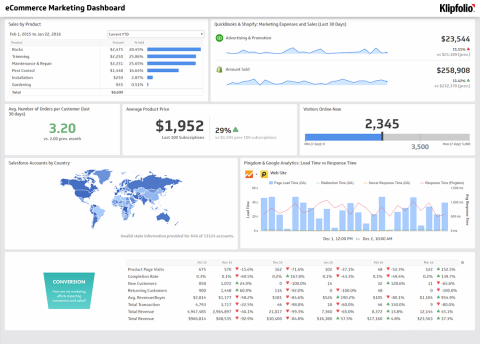 KPI dashboard software is usually customizable and often comes with features like instant performance reports and alerts when a KPI is over- or under-achieving. Instead of using comprehensive KPI software, you may opt to use the tools you already have or integrate new tools with your current system. Check out these 14 tools for WordPress data visualization or these tips for monitoring WordPress activity using the dashboard. Tell the rest of the team. Share your objectives and the KPI you chose for each with the rest of the marketing team. Everyone should be on the same page regarding your objectives and how you’ll track and reach them. Tell them what you’re going to measure and why you’ll be measuring it. Review your objectives, KPIs and results. The timeline for reviewing each KPI will vary. Some you’ll track daily or weekly, while others you’ll check in on monthly or seasonally. Create a schedule for when you’ll review each KPI so that you’re making changes on a consistent basis while still giving your campaigns enough time to produce helpful insight. When it comes to your objectives, review them on a regular schedule, such as monthly. If a marketing objective changes, you’ll want to tweak the KPI, too. There isn’t a business in the world that’s doing every single thing perfectly all the time. The beauty of determining where you need improvement and creating a KPI to help you get there is that you can always evolve your business, create more compelling marketing campaigns and reach for a new goal as soon as you meet the last one. Need some more help with lead generation? Here’s how to generate more leads with Divi. Thanks for sharing this post and I don’t know what is KPI after reading this clearly understand it and please share something about the telemarketing mailing list for us. Is there any employee performance KPI available from which I will able to track the performance of the employee? It’s used to analyze such metrics as the time it takes for toast to brown and how long a sunny side egg needs to be cooked until it’s not too runny. Good article, I need to learn how to use KPI’s for my Google Adwords. SEO KPIs can be tough because there are so many unknowns. However, I also like to use overall impressions and CTR in the new Google search console setup. It’s a great visual for a client to look at and see an upward trend since I first started optimizing their site. Nice article, thanks for sharing this amazing information for me. I have got a lot of information on these articles, really it will help me a lot. keep on updating for latest trend topics. Some great points, especially the bit about KPI’s being different to business metrics. I guess it is all about the “K”, the fact that they are key. I also liked that you only recommend tracking 3-5 KPI’s, a lot of people can get overwhelmed with items that they are tracking and end up not focussing on the ones that will have a real impact on the business. One of the great benefits of the digital world is the amount of data that can be tracked and analysed. One of the down sides of this is that there are so many different metrics out there a lot of people are unsure as to which ones are key. On top of all this data that is a KPI for one business may not be for the next one. I think your comment on working out what is a key indicator and what is simply a business metric is extremely valid.